What is the most important part of opening a new company – in Hong Kong or anywhere? Getting a bank account opened up. Having trouble getting a business bank account open in Hong Kong? Or other parts of the world? I’m hearing it more and more from everyone. More and more rejection letters. Have you been following international business trends over the years? Then you have seen quite a tightening up on new business account openings. Hong Kong is a financial center of the world, yet the past couple years has been getting so much more of a hassle to get an account opened. As I have been working with so many clients with their bank account opening headaches. This sparked my interest to re-experience this tedious process for myself. It is much more difficult than “back in the day”! I spent 2 days visiting as many banks in Hong Kong as I could. There are so many banks in Hong Kong! I estimate there to be over 50, depending on your criteria for a bank – commercial or retail or investment. I was able to cover about 20 of them. That is – depending if you consider walking into a branch and getting an immediate rejection as a bank visit or not! How Is Your HK Bank Search Going? Before we get too far into it, let’s share where we are in the Hong Kong banking process, fill out the quick poll below and see where others are in your situation too. What Stage Are You In For HK Banking? As banking in Hong Kong is near impossible for non-HKID holders, we have started to see more and more business owners leveraging cross border payments, check out our full guide and comparison. We spoke online a while back regarding a HK bank account, we also met at the DC BKK conference where we spoke about the requirements and struggles of a HK bank account. The last time I went to HK I came into a few difficulties this time I’m going with a rental month contract for my Bangkok residency (don’t laugh!! ), and will explain I’m growing the business in Asia etc and don’t have utility bills etc. I guess my chances are pretty slim, so I decided to hit a few banks while I’m there. This lead me to creating a spreadsheet with lots of useful info which I think I would be useful for your listeners / site visitors. I used your post as a base and then worked through. It includes which banks / phone numbers / branches etc. So if anyone is in a similar situation to me (with slim chances) then they can organise multiple interviews as I have. 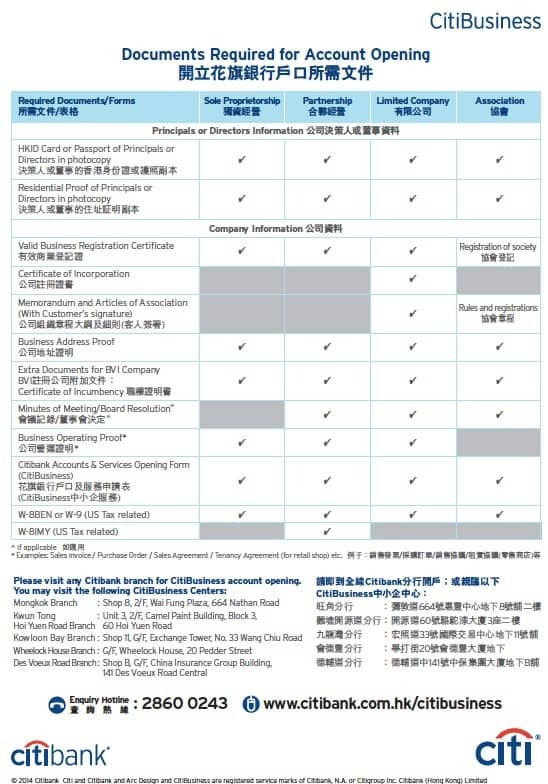 Download The Hong Kong Bank Interview Coordination Sheet! To get this bank appointment checklist, please Click Me! Now, back to the normal banker guide! thought some updates for your readers. last we spoke we met up with DBS and was told would take 3-4 weeks as long list of application. banker said HSBC and standard charted closes a lot of accounts of late. so hence the long waiting time to pass the approval, DBS set up fees is steep HKD10000. and i believe monthly account fees is HKD150 for online banking. on another note, met with a RM in OCBC wing hang branch in central, tried to sell me some insurance products and said will ease my business account opening but still subjected to approval. Same info i got with Public Bank HK, wanted to discuss some products with me. Wonder if you have feedback on this? it is really easier to open a business account with them if we buy their insurance products? We didn’t continue the account opening process with ocbc but was just wondering perhaps some info would be helpful to your readers who looking to open a business account in HK. other banks that were previously said will get back to me didnt get back to me for eg. hang seng bank. Maybe because they are linked with HSBC. i managed to open offshore business account in singapore for my HK company as well but i dont really like offshore account as i strongly believe a biz registered in HK should have a local bank account. once i have settled my banking and get more feedback with the banks, i will probably email the team in InvestHK and HKMA about this hassle and trouble. HK dont seems like a good place for business anymore, cost has definately gone up a lot since we incorporated in 2009. Let’s hope it gets better….some new services forming I hope to announce soon. Hi Michael, thanks for the very informative blog post – lots of interesting information and I just wish I’d seen all of this earlier! My question is this: Since I am coming to HK anyway between Monday and Wednesday next week (partly for an Indonesian visa run and also to process another visa for China to meet a potential business partner in Shanghai on Wednesday night) do you think it would still be worth my while collecting my official company documents from Startupr.hk and visiting any branches in person? Also, it sounds like you have a ton of experience in terms of doing business in Asia and I’d love the opportunity to meet for a quick coffee if you have time? There may be the chance to collaborate in some way? Now back to the original article. Business is new, under 1 year old. I did this to represent most of the clients I am working with. Though the American nationality was an extra negative in this process. We’ll will dig going through these various banks below. 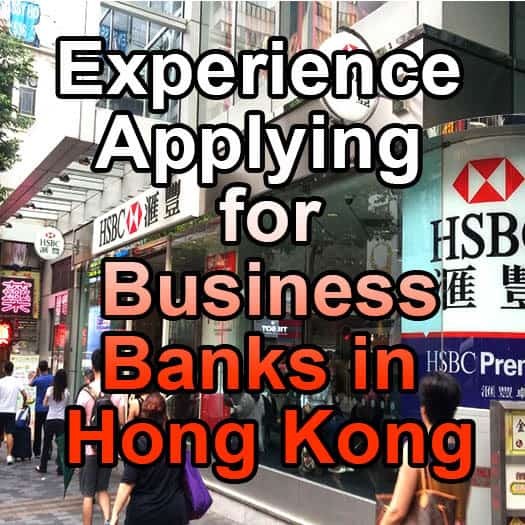 What have your own experiences been in applying for bank accounts in Hong Kong? Please note, this is for business (corporate) accounts, and not personal. I believe personal accounts are still easy and straightforward for you to get in HK, but didn’t attempt that in today’s post. Curious if it’s still possible to get a bank account for HK company. We’ve been looking to do this for a while but keep getting jerked around. Recently we were about to head out a couple weeks ago to file applications, but we were told we needed approval from Mainland China to do so. So we didn’t end up going. What do you believe is feasible these days? We’re an e-commerce business and source/ship apparel products from Thailand. But because banking system isn’t great out here we need an entity outside of TH to link up with stripe, Braintree and such. Also I’m curious if it’s possible to sidestep the process by purchasing an existing HK company with bank account and transfer it into our names. Curious to hear from you what is possible these days. We have been discussing and updating people in our newsletter (such as this one 2 weeks ago about HKMA urging banks to loosen up) that the HK government and regulators don’t want the banks to be so strict. But the banks don’t want to open up. Some say it is because they prefer dealing with only bigger clients anyway and use this as an excuse, while others say it really is because they want to be extra careful to avoid fines from US regulators. HSBC SME centers are all over Hong Kong. I went with my friend Mike “The Greek” as he doesn’t currently have an HSBC account. We went to the Jordan branch on Nathan road without an appointment. Entering the retail bank location on the ground floor, the greeter asked how to help us. She was friendly and when we said a business account, sent us to the SME center on the 18th floor. The secretary greeted us and then had a small business banking client rep meet us in a conference room within about 5 minutes. He asked us to confirm it was a business account for a Hong Kong limited company. He also asked if it was for a new company or a company that was older than one year. Number of directors needed to form a quorum / beneficial owners to be present for the account opening. 3. Memorandum and Articles of Association (M&A) / Articles of association and any amending resolutions. 4. Latest notification of change of secretary and director (appointment/cessation) (form D2A/ND2A), return of allotments (form SC1/NSC1) and/or Instrument of Transfer, if applicable. 5c) Director / Shareholder / Beneficial owner declaration (DD),sample available upon request, issued within 6 months. D1: Full name, ID type, number, and date of birth. Ownership structure chart showing company name, % shareholding, the country of incorporation, the country of business address in each Intermediate Owner up to the Beneficial Owners of the company and specifying the issuance of bearer shares in the chain of ownership (including the company, all Intermediate Owners and Beneficial Owners), certified by director. Indicate if there are family members amount the Beneficial Owners and the family’s total collective % shareholding, if applicable. Trust deed, identification proof and residential address proof, and identification proof of trustee. Minimum balance is 50,000 HKD, else a 100 HKD/mo service charge. The process was so fast it amazed me. The SME center was empty. We went at 10:30am on a Thursday so maybe that was a good time to go. Maybe I should come to this branch more often, the TST and Central branches are so overloaded whenever I visit there. I went to three different locations for this bank. It was a rainy day in Central (i.e. typhoon) and I stepped into 1 DBS branch. They were nice to service me right away. I said business bank account, and they immediately told me they only helped with retail clients. Pointing me down the road to the DBS headquarters in “The Center” (A massive business complex) I proceeded to walk down Des Vouex Road. Not able to find it after asking a few guards, I figured I would find another branch later. The next day on Kowloon side I went to one down the road from my friend’s apartment. They were also nice and told me to go to one at Mira Mall on Nathan road, on the 11th floor, for business banking. I didn’t have time to get there this visit. I’ll update this post with news from that branch. The client services rep at the front office also gave me the number 2290 8345 to make an SME (small to medium sized enterprise) banking application appointment. Update: So I went back with a client at the end of Oct, 2015. At their SME center at Miramall in Kowloon. After waiting in the customer service room for about 20 minutes, they spoke to us. They said the account opening fee is $10,000 HKD (about $1,250 USD) and then the yearly fee to keep the account open is another $10,000 HKD (same as account opening fee). Totally crazy. My client wasn’t willing to pay (I understand completely) and we left. Leave your review and experience dealing with DBS HK here. This was a bank I had not yet heard about until doing this exploration. I found their Jordan branch (again thanks to Mike the Greek for pointing it out to me!) and walked in. Such a small bank, and there was two tellers and a line of about five people. I walked to the back and there were a few bankers on the phone. They seemed to be discussing the stock market with clients. After one hung up, I mentioned that I am interested to open a business bank account. Being the only foreigner they may have seen in a while at the bank, he was wondering why I am interested in their bank? I explained I want to have a few bank accounts in my company here in Hong Kong, so that if I had a client who wanted to pay me in one bank account or the other, they could choose to do so. Seriously, what is wrong with applying for bank accounts at multiple banks? I did explain I already have an HSBC bank account, thinking that would be a good thing. Not sure if it was or not. He asked me more questions about my company. Where my clients have their headquarters? What is my company operation’s base. He checked my passport and looked for my visa. He saw that I am a visitor in Hong Kong, and I explained that I am under my Chinese company’s work permit in Shenzhen. Seemed to cause more confusion. He was polite though, and then asked for me to wait while he asked his manager. I sat. Such a different look and feel from HSBC. They were not catering to the foreign market here. Everything in Chinese language. Computers at the waiting lobby with stock trading platforms ready for clients to login and trade on. When he came back, I could tell it wasn’t going to be positive. After at least 10 minutes discussing with his manager in the back room, he explained I need a HK ID card. I told him I already have an HSBC HK business bank account and that wasn’t needed. But then he explained I got that years ago and times are much more difficult now. Guy was nice though. He gave me his business card and said if I get a HKID then it would be much more helpful for him to assist in opening a business account at Chong Hing Bank. Leave your review and experience dealing with Chong Hing here. Down in Central I walked into one of the many Bank of China branches. It is worth noting that I do have a bank account with Bank of China – but it is in Mainland China – not in Hong Kong. This is a completely separate entity and there is no connection between client accounts. So I walked into the bank and pulled a number from the waiting machine. Just a few ahead of me, I saw with a nice woman who asked how she could help me at the bank today. I explained I have a business in Hong Kong and want to open a business bank account. She asked if it was for a limited or unlimited account. I explained it was a limited company. She was going to seat me down with a client service rep but I explained I wasn’t ready to apply today. I was collecting what information I needed to bring. She walked to the back of the bank and got me a sheet of paper with a long checklist. I’ll type it out below to help you out. Seems like most of the other banks. It also had a brochure of the account details and terms. Most interesting to you is that you need to hold 50,000 HKD to avoid monthly fee of 120 HKD. I thanked her for her time and said I would come back to apply later. She gave me the customer hotline – 3988 2288 to call ahead and arrange an account opening interview. After making an appointment, please bring the following documents to the designated branch of Bank of China (Hong Kong) Limited (the “bank”) to open an account. – Certification of Incorporation (CI) and subsequent Certificate of change of name, if any. Note: Apart from documents listed above, we may further request you to provide other information and documents required for account opening, if necessary. Leave your review and experience dealing with Bank of China HK here. This one was going to be fun! Seeing a Thailand bank in Hong Kong intrigued me and I have walked by this branch many times during my years commuting around Hong Kong. Today was “all you can eat buffet” of banking visits, so I walked inside. An exotic and expensive interior. Felt like a temple, with high ceilings and brass metal trimmings and a green hue. I walked to a teller and explained I was looking to open a business account for my Hong Kong company. She said that it needs a referral, but I can wait for the manager to discuss. She pointed me to a corner desk in the front right of the bank and I walked over. The manager was a professional woman, and was dealing with a client. My Cantonese language skill isn’t so good, but they were having quite a nice conversation. I wondered if she was a big client for the bank, trying to determine how bankers may decide who to treat well and who to pass by. So that was it, I said is there any other way. She said no, need a referral. She was polite about it, but I was still amazed they would turn me down down flat out without any questions about me and my business. So that was 15 minutes or so of a waste. Time to head to the next bank. Leave your review and experience dealing with Bangkok Bank here. Next door to Bank of Bangkok is a bank called “Public Bank Hong Kong” (pretty generic right?). Walking in, there was a client services rep available at the desk to the right and he asked how he could help. I explained I’m looking to open a business account for my Hong Kong company. I said no other way, he said, no. He apologized and wished me well. That was a quick one! Leave your review and experience dealing with Public Bank here. Walking into ICBC I went to the second floor of their branch to the business department – this was in TST, Kowloon district. Waiting at the teller line they pointed me to a desk for client services. It was a nice woman who greeted me and invited me to sit down right away. I explained I wanted to open a business bank account. She asked if I knew anyone in the bank who had an account. I needed a referral. But she worded it as knowing someone else who had an bank account there and if they introduced me to the bank. For the sake of this blog post and assuming I am a foreigner visiting Hong Kong to do business for the first time I said, no I didn’t have anyone I knew there who had an ICBC bank account. She apologized and said I needed to know someone who had a bank account there for at least 1 year (I believe it was 1 year). Knowing I wouldn’t be able to find another way, I asked her if I could at least get a brochure of the banking account options or other checklists. She said they didn’t have that and to check the website. Thanking me for my time, she said goodbye. I walked downstairs. Going to the MTR I saw massive billboards advertising ICBC. I wondered, as a marketer myself, what the cost was for that and then to turn away potential clients right off the bat when they walk in the door. Leave your review and experience dealing with ICBC here. Here is another bank that is more seen inside Mainland China, and they have a separate banking entity here in Hong Kong. I walked in to one of the many I saw and asked about a business account. The first time I went in they gave me a phone number to call, but during my day I passed so many I walked into another. This branch was pretty friendly and brought out a piece of paper with a list of all their branches. The teller then highlighted 3 of the banking branches where you could apply for, and get client service for, your business bank account. Here are the 3 locations to apply for the business bank account. I’ll have to stop by one of them and update this post. Leave your review and experience dealing with China Construction Bank here. At first I wasn’t even going to bother going into Citibank. I have just heard because they are a USA bank they won’t help Americans open bank accounts in Hong Kong anymore and tell you to apply to Citibank USA. But what the heck, let’s swing on in. Business Operating proof – examples – sales invoice, purchase order, sales agreement, tenancy agreement (for retail shop), etc. I also explained I am American and if it was a problem. She didn’t seem to make me feel like it would be a problem, and just pointed to the bottom of the checklist for the American requirement part. The whole ordeal took just ten minutes or less. But again, who knows how hard it would be to get accepted after applying. Yet it was still nice to know I could just apply, and not deal with this long inquisition about who I am, or require me to “know people”. I contacted Citi through their online form, this is the response I got back. Thank you for your interest in account opening in Hong Kong. Attached please find the basic document requirement for account opening and the five Citibank Citibusiness branches address. Kindly bring all the original copies when visiting our branch cause there is no pre-approval arrangement before arrival. Please note that both the Director and the Shareholder (over 10%)/Authorize Signer need to be in person in Hong Kong for account opening. For your information, company should be registered in Hong Kong and with an operating office in Hong Kong. Please be reminded that all account opening will be subject to the final approval of the bank. Once again, thank you for choosing Citibank. This was another small bank I had noticed in the past walking around the city but never paid attention. It has a pinkish / purple banner logo that now will forever be in my memory. Walking into a branch on (or near) Temple Street, the guard opened the door for me with a smile. He directed me to a row of desks for new account applications. I may have been one of the first foreigners to enter the bank for quite some time, they were all a bit shy to service me. Finally a woman bank teller invited me to sit at her desk. She asked me how she could help. I explained I opened a new business and needed a bank account. She asked me a few more questions, one of which was my nationality. I answered I was an American. After collecting the information, she then went to speak to her manager about it. A few minutes later she sat back down and apologized. The bank cannot accept new bank account applications from US Citizens. She explained there is a lot of paperwork and regulations for Americans now and they are not able to help. I thanked her for her time and the guard opened the door for me as I left the bank. Again, with a smile. I guess now I know how it is to be discriminated against. Flat out told you can’t do something based on your nationality. Leave your review and experience dealing with Chiyu Bank here. This is a local bank whose logo has stuck out to me over the years. I walked in to a branch across the street from my Nathan Road office address in Kowloon. It was a small corner unit branch with 2 floors. The teller on the first floor told me I needed to go upstairs for the business banking. There were only tellers on the 2nd floor, behind glass. I waited my turn in the queue and went to my assigned teller. She was shy to speak English to me and blushed a bit. She leaned over to the teller next to her and they switched his customer with me. A quick flip of the customers and I talked to the male teller now. He asked me a range of questions, who I am, where is my business registered, what is my ID, do I have a HKID. After a bit, he went to the back to get me more information. After coming back, he then explained I needed a 3 year old client referral. That means, a client who has had a current account with them for three consecutive years. Maybe I can find someone I explained. I asked for his name card, but he didn’t have one and gave me the VP of the branch’s instead. I complimented his English skills and left the branch. Leave your review and experience dealing with Dah Sing Bank here. Down the street on Nanthan Road I saw OCBC Wing Hang Bank. They have a bright red logo that has always caught my eye. Time to step in and see what is up. Waiting for the tellers in the back, I was up next. The teller made a call to the account rep in the front and Kelly came to get me. I sat at her desk. She asked if I had any other banks, I explained I do have HSBC. She then wondered why I would want any other banks in HK. I explained I wanted to have a few options for different customers. She pulled out the form and marketing brochure, and here is the summary. Seems I could have applied right then and there, but I said I would need to gather all the information and come back. Leave your review and experience dealing with OCBC Wing Hang Bank here. In Central I swung up to Wing Lung Bank. This merged with China Merchants Bank (CMB) a few years back as I remember. Before it didn’t have the CMB logo. Out of nowhere throughout the branch network I saw the logo updated – so the recent merger is my own assumption. It was a massive branch, with escalators taking all visitors to the second floor. 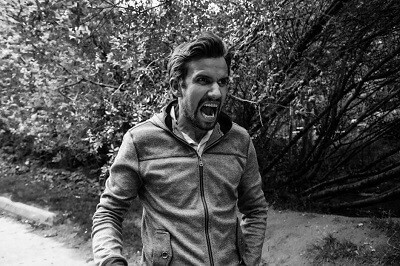 I waited at the teller line and then they directed me to the client services department. I saw 2 available agents and asked if they could help me. One volunteered and asked me to sit down. Here is the big news! So I said I am interested to apply soon. I was expecting that to be good news, but he said there is a backlog. It would take 3 months before the bank could review my account application. He explained that once I apply, it would be set in a waiting line now and that the backlog was at least three months. Jeez, three months! I guess if this is just a secondary bank account or I have no other choice I would go ahead and apply. Unbelievable. He gave me his name card and said he could help me if I had any questions. Leave your review and experience dealing with Wing Lung Bank here. A few friends recommended I try this bank out. Walking in to the branch in Sheung Wan, I wanted to see what the fuss was about. I couldn’t find an area for business banking, so approached the investment division. A professional man invited me to sit down and discuss my situation. I explained I wanted a business bank account. Again, asked me about my company, is it a local HK company, is it a limited company, and other things. Memorandum of Association and Articles of Association (and any amendment resolutions). As company incorporated on or after March 3, 2014, only Articles of Association (and any amendment resolutions) is required. 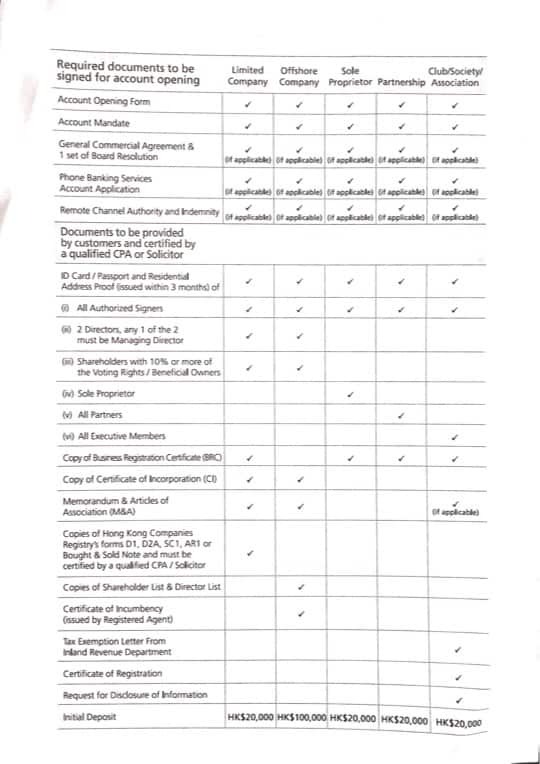 Copy of Incorporation form (Form NNC1 or NNC1G) (or last annual return (form NAR1)) plus all subsequent Note of Change of Company Secretary and Director (form ND2A or ND2B), Return of allotments (Form NSC1), Instrument of transfer detailing the particulars of the current directors and principal shareholders. Copy of Hong Kong ID card or exit-entry permit for traveling to and from Hong Kong and Macau. Or passports of a minimum of 2 directors, including the managing director (unless company has one directory only, or more than 2 directors are required to form a quorum), all authorized signatories, all principal shareholders, and all Ultimate Beneficial Owners. Details of ownership structure and control of the company, e.g. An ownership chart. If directors or shareholders are corporate entities, document 1 to 5 should also be provided for these companies. If directors are corporate entities, copy of directors’ board resolution of corporate directors resolving to appoint authorized representatives to handle banking business of other companies. Global Application for Accounts and services- for corporate / entity and self certification on U.S. Person. Copies of all documents submitted should be true copies certified by suitable certifier. If original documents are not in English or Chinese language, an English translation of the same should be provided. Apart from documents listed above, we may further request you to provide more account opening details and documents when necessary. The bank reserves the right to decline any account opening request without providing any reason. A copy of deep poll must be provided if the individual has changed his/her name in Hong Kong Identity Card (I.e. A letter “N” will be shown on a Hong Kong Identity card). If the individual is Taiwanese person, copy of National Identification Card of the Repblic of China should be provided. – A solider, an accountant, a notary public, an auditor, a tax advisor, or a member of the judiciary in an equivalent jurisdiction. – An officer of Fubon Bank. Instead of providing copies of documents certified true by suitable certifier, you can also present the original documents to any of our branches for certification by a bank officer. In the event of any inconsistency between the English and Chinese versions of this document, the English version shall prevail. Update: October 2015. I went back to this bank with another client. They saw that the company was just opened a week ago and didn’t like that. They took copies of all the documents we had and said they will call us. They seem to want to meet in person a few times before opening the account. 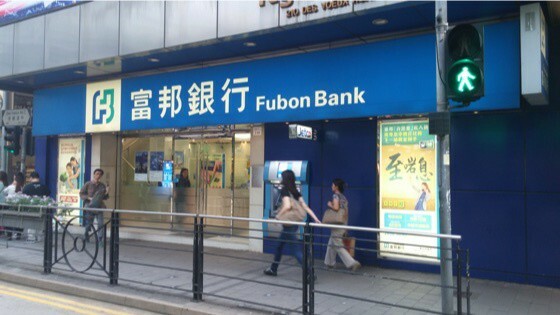 Leave your review and experience dealing with Fubon Bank here. Another local bank I walked past a ton of times in Kowloon and never paid attention to. Entering the branch, the guard was super nice with the door and a big smile. On the left there was a corner area for clients to do stock trading. About six terminals with stock tickers passing, it was a full house. Chatting and socializing, while also trading stocks and reading the newspaper. Seemed like a mix between a coffee shop and a casino. I walked to a desk on the right, and he was in the investment division. The man was nice and brought me to a desk in the back left side of the branch and asked me to wait. Another client service rep walked in from the back office. He asked me a few questions about my business and why I was picking his bank. I explained a friend recommended the bank to me. He wanted to know who, and I gave him the company name and person’s name. That seemed to help out a lot. He was much nicer to me it seems after he came from checking out the company that introduced me. I felt pretty good about this bank, and will apply for it once I get all my information ready. Update: October 2015. Went here with a client. They really kept asking if the account holder would do business locally in Hong Kong. They said they focus on local businesses, not overseas companies. He took all the documents and will email us. Leave your review and experience dealing with Shanghai Commercial Bank here. 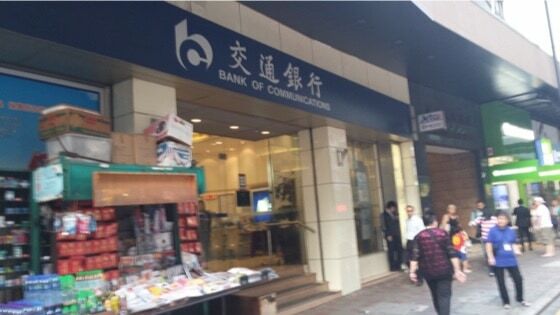 This bank is a Member of Bank of China (BOCHK) group. What does that mean? I’m not too sure either, but when walking in, the teller gave me the exact same checklist and brochure as Bank of China. Even on the bottom of the checklist pages (in the footer) was the Bank of China signature text. The fees and everything else was exactly the same. The banker asked me why I wanted to apply. I told her I have HSBC already but looking to have a second bank account to give clients different banking options to pay me with. She had a look of confusion on why I would want another bank account if I already have an HSBC. She didn’t say it, but I felt that she was saying I should just be happy I have an HSBC account and skip applying there. I thanked her for her time and the information and left the bank. Leave your review and experience dealing with Nanyang Commercial Bank here. This is a Swedish bank with operations in Hong Kong. I didn’t go to their branch office, but instead made a phone call. The contact my friend gave me was out for the day, and they took down my name and number to give me a call back. Within 20 minutes they called back (awesome!) and asked me a few questions about what I was looking for. After answering (based on the criteria in this guide), she said they can’t help me. They are a branch office for companies with accounts in Sweden, Norway, Finland, and other Norwegian locations. She gave me a contact to an agency who could potentially help me get introduced to the right banks in HK, and followed up with an email. Nice, but as they say, no cigar! Leave your review and experience dealing with Svenska Handelsbanken AB here. After a lot of feedback from this article, as well as our newer FATCA problems infographic, I’ve had some USA CPAs tell me to go to an American bank in Hong Kong, specifically Bank of America. They only do commercial banking here, which could work for us in the small business department. Called up their HK contact us hotline at 2847 6111 and asked for commercial banking. Was transferred through – no hold time! The woman was nice but said they don’t do new accounts in Hong Kong. That I need a commercial account in USA. I told her I don’t have a commercial account in USA for this HK limited, but I have a personal account in USA. She said it has to be a commercial account. She called it a referral, by having an account in another country where Bank of America is. Seems back in 2010 they had a branch here, but when China Construction deal happened they moved everything to them. Leave your review and experience dealing with Bank of America here. I wanted to get this guide online as soon as possible. It took me two full days to gather the banks I have already covered above, way more time than I expected. Over time I will visit these banks below and gather more details and information. On top of adding more information on the banks below, I’ll also try to maintain the banks above information. Still, just a quick disclaimer. I’m doing this guide to help you out – but please do your own homework and due diligence before applying! I have no idea how to pronounce this bank name – luckily this is a text guide and not an audio podcast! I’ll ask them when I visit. Leave your review and experience dealing with ICICI Bank here. Friends have told me this is a tough one to get approved for. And if you’re approved, the minimum balance requirements are quite high. Update Nov 17, 2015: So I made it to BEA finally! I’m exhausted with all these banks so took some time to get energy to visit a new one! Walked into one in Kowloon side. It was rather quiet (as opposed to the normal insanity). Only about 5 – 6 customers in queue instead of the normal mania at most banks here these days. 5. Latest Annual return Form (NAR1) if company is over 1 year old. 7. Banker’s reference (required!) from a Hong Kong bank – business or personal account. He asked me if I was a new registered company, which he assumed right away (I do look pretty young). So by having a company less than a year old I can skip some of the required documents like annual return. I mentioned I am American, and he said oh, they are not accepting American clients now. He said that the US regulators talked to them and said they have to do a lot of paperwork. This guy was nice and open to me – he explained that there are some US clients who have been waiting 6 months for an account and it is still pending. I was a bit disappointed, so he said that if I’d like to try, I can bring my W-9 form in filled out already. But he just said it would be a lot of work. I don’t want him to get in trouble so I won’t share his name – but he was nice! He explained there is a list of high risk countries that the bank doesn’t do business with because of political reasons. It was a bit funny he mentioned that after he said they don’t accept Americans anymore. USA wasn’t on the list – but I am starting to imagine it being on the list soon. I asked how can I get a bank letter of reference from a Hong Kong bank if I am a new business and I’m new to Hong Kong. He said this is what his management makes him do. That it is getting harder and harder. He asked me if I can find other banks that are easy. He was asking me which banks I think are the easiest now – that other clients tell him all the banks in Hong Kong are getting harder. Since he was more open with me, I opened up with him. I explained that I have visited over 15 banks in the past few weeks and am doing research. Then he asked me what my business was. When I mentioned accounting, he said that is a high risk business and this bank won’t accept accountant firms. Wow! He said they verify the business by looking at transactions in the business, not just the invoices. While I wasn’t too happy with the results, he was open to me trying to apply. The bank account minimum balance is one of the lowest I have found with 10,000 HKD minimum to avoid the 100 HKD monthly fee. Another thing to note! During the conversation, he said new bank accounts cannot receive T/Ts (telegraphic transfers!). At least not for the first 3 months the account. So for those reading – this is for the most part not useable if you live outside of Hong Kong. The account is only useful for domestic HK business until 3 months pass. Leave your review and experience dealing with Bank of East Asia here. On my list. Almost walked into one during my trip but just too tight for time. Leave your review and experience dealing with Bank of Communication here. Have gone to this bank a few times with clients I’m working with. I have to confirm, but a couple months ago they asked for a non-refundable application fee of 1,000 HKD! The client had no interest in giving them this fee without the slightest hint he would have a chance to get the account approved. The banker explained they charge this non-refundable fee because the heavy amount of paperwork they are now required to fill out. That it costs the bank a high administration fee. She also explained she couldn’t give idea if they could approve his application as the process in the back office. Further she said that the bank no longer tells people what to prepare. This is because there have been cases of applicants fabricating documents to pass these requirements. Obviously this left a bad taste in our mouth and has given me hesitation to apply. Leave your review and experience dealing with Hang Seng Bank here. I have worked with a client to apply here back in the early summer. They were professional and helpful. No application fee. But the minimum monthly requirements was 300,000 HKD else a 200 HKD fee. Quite high and the client said even if approved for this bank he may not keep it open too long. Leave your review and experience dealing with Standard Chartered Bank here. A few people have told me to check out ANZ. It is on my shortlist and I will check out this bank. I just worry that if its headquarters is in Australia they may not help local companies in Hong Kong. At GFA – we are committed to help you find the best financial services for your business. We were approached by a FinTech startup in HK – Neat – and have a full blog post on their solution – read the blog post on Neat HK business banking solution. So there you have it. Did I miss any banks? Let me know! What common trends did you see? Knowing an existing client at the bank seems to get certain bankers to “perk up their ears” and pay more attention to you. Others require this referral. And some banks seem to don’t care at all (HSBC). Having a Hong Kong Identification Card, with permanent status (there are various levels of a HKID) is definitely a help when applying. Maybe this is because they see the applicant as more legitimate. Some banks stated it was due to new regulations. Others didn’t seem to ask and just had a policy for passport holders as well. There was some different requirements needed if your company was over a year old. Not sure if it is more helpful if your bank is older or not. Some of my friends tell me they had the bank tell them their company should be 2 years old before applying (HSBC told him). Nevertheless, there are some differences in applying depending on your company being over or under 1 year old. M&A – Memorandum and Articles of Associations. Proof of Residence – a 3 month old or newer proof of your residential address, in English or Chinese. Government or utility bill. Which Banks Did I Like? After all this, the 2 jam packed days hustling between banks, which ones stood out? Well, I’m not sure if it’s fair to be honest. It also depends on the luck of the draw with the customer service rep and also how I acted in each situation. HSBC – while I know the bank account applications are hard to get approved now, it is so professional and high class. Citibank – wasn’t expecting to put this one here, but they were so nice at the branch. Others have also said they have great customer service. Shanghai Commercial – they were nice, well, after I told them I knew someone that already had an account. Maybe if I told all the banks I knew someone who had an account they would treat me nicer. This is another reason I feel it’s not fair to pick my favorites. I based the three above more their customer service and clear documentation than anything else. Want To Go Out On Your Own? Now it’s your turn! Please leave a comment below and share with us your own experiences. I hope this guide is full of amazing experiences and tips and warnings. Let’s all work together to make it easier to get a business bank account in Hong Kong! Doing business with a HK company is great, let’s try our best to let more and more new business owners get the same experience. “I’m always setting up bank accounts here in Hong Kong for redundancy reasons [removed part] Have done the same thing that you’re talking about… walking around trying to get a bank account. If you’re not going to receive a referral to the bank, I’ve seen the most success with doing everything via e-mail/phone first (directly with the RM) and then going in for a follow up about the application. It’s definitely become a lot harder to open up bank accounts in Hong Kong! Many people aren't willing to share their story publicly. Global From Asia put together a private members forum where you can share with other vetted business owners. Not messing around, are we? Then you made the right choice by investing in our Hong Kong Supercharged program to ensure you have everything you need for your Hong Kong banking and business experience. The ultimate business guide for researching, setting up, banking, upkeep, taxes, growth, and more. Glad you enjoyed this post! Trying to bring clarity in such a confusing topic with “muddy waters” – let’s see where it takes us! Yes, I also was noticing BVI as I was transcribing those application list forms….I didn’t verbally ask them about offshore or BVI in person. Yet, sadly as you mention it is getting harder and harder for offshore companies to get bank accounts in HK. I’ll see HSBC early next week and will ask them for ya 😉 stay tuned. I currently have a HSBC account, and would like to have one other bank account in HK for the same HK company. I opened the company in June and planning a trip to HK in two weeks. Can you recommend which other bank would be a good option? And would HSBC be an option to open a second account for the same company? HSBC you can open a second account, and they make you apply from scratch again. So if I were you, I’d apply to other banks – so that you can “hedge” a bit depending on what the future holds for all these banks. For now, other banks on my list are Hang Seng (but they have been implementing upfront fees), and Citibank. Thanks for the information. I will see about making an appointment with Citi. I stated two weeks, but actually my flight out is this coming Friday. I head back on the 23rd and while I would love to attend the party, have to get home to get rested up for Thanksgiving. I do want to say that I love the podcast, it has helped tremendously in my business. So happy to hear you love the podcast – really inspires me to keep pushing on this! I’m starting to offer full service assistance for people with opening HK business bank accounts, would love your feedback on the service – maybe we chat when you’re in HK? I’m here Mondays to Wednesdays nowadays. I will be in HK from 15th to 16th. Have a appointment with HSBC the afternoon of the 16th. Looks like your office is right down the street from the Hotel I usually stay at (Holiday Inn Global Mile), maybe I could stop by to see you that morning? Nice post! I’m being asked for an introducer at Shanghai Commercial Bank before they can help for the opening. Do you have one I can use? Thank you in advance! Yes, need an introduction – let me send you a private email. Introductions I need to speak to you about your business and get to know you a bit – else it can come back to “bite me”! Public Bank is originally from Malaysia and while DBS Bank is from Singapore by the way. Visited some Citibank branches and got the impression that they don’t have experience dealing with foreign companies nor offer good service to smaller companies in general. I see no reason to use them over HSBC, BOC, Hang Seng etc. Guess it depends who in Citibank you talk to – which branches did you go to? 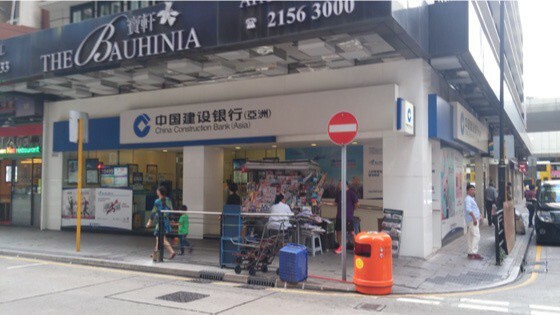 The two branches with “Citibusiness” in Central and the branch in Sheung Shui. All were small, had no special business section as far as I could see and required some sort of Hong Kong presence. Either that you be a resident, that the company operates out of Hong Kong and/or that you come back later for more questions. I have an Off-shore company in HK. I sell self-help products in german language on my website. I registered the company only a month ago, but I am making profits since 2014 (with the company registered in Germany). I applied already for a business account at HSCB but the denied it. Any idea which bank I could get a corporate account? I have an online business making profits but it is not related to Asia or HK and I don have a HK ID. So sorry to hear you were rejected for your application at HSBC HK. I am trying my best to talk to them and others in HK government about this tightening up – seriously getting more and more requests each day from people getting denied – so don’t think its just you. Really they want to see more Asia / HK relevancy to the business model I believe. Where are you based and working from? then we can learn more how to help you! Valuable suggestions – Coincidentally , if anyone needs a a form , my friend found a sample version here https://goo.gl/f3qKzf. Really detailed awesome post. Any idea if I can have any problem trying to open a personal account in HK without HKID, but with proof of residence? The question they normally asked me was if I have a HKID – not if I live in HK. Of course you can explain you are in the process of getting a Hong Kong Identification card, its worth a shot. Basically – since I wrote this post – banks have gotten even harder. But please share your experience here so we can all learn how it is currently as it is changing often. Great to hear about your success with OCBC Singapore. Just to confirm, was that using your HK corp, or was a local Singaporean corp needed? Hey Henry, thanks for the update! Any news on this? Did you get accepted by another bank? 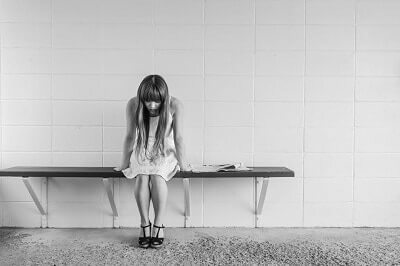 So sorry to read this painful experience – yes Hong Kong has changed to the extreme since I first started this blog and wrote this blog post. I guess they don’t want entrepreneurs here anymore, it is really a disaster. Thank you for this article, its very helpful. We’ve been through the ringer as well with rejection after rejection, and now considering offshore banks. Just FYI- I contacted our Bank of America RM in the US, and you need to at least US $20 million in revenues before they can refer you to the HK branch. Tough to meet for our start up. Glad the blog post helped. unfortunately the world is going more and more to the rich get richer – and banks jus want to deal with big companies more than ever – and try to force us to stay where we were born to do business. Crazy isn’t it? HSBC HK has just rejected my application this week (March 2018) after 8 months never ending business proofs submittals. My consultant in HK -who helped me setup the HK incorporated in 2017- has just suggested to try now opening the business bank account with OCBC Wing Hang. After reading your post I am concerned whether its internet banking still useless. Would be great to hear recent experiences from others dealing with OCBC Wing Hang. My partner and I we are both citizens from Argentina. We have an 18months old company registered in the United Kingdom (LLP). We have customers all over Europe and in HK as well, reason why we would like to open an account there. To make payments easier… We may receive around 300K EUR from these HK customers per month. What are your feelings, which banks should I get in contact with? Regards! I am sincerely sorry to see this horrible experience you have been through. My idea is to have it transferred to another Paypal user who can withdraw it – yes there are transfer fees, but this is the solution for now in my opinion. 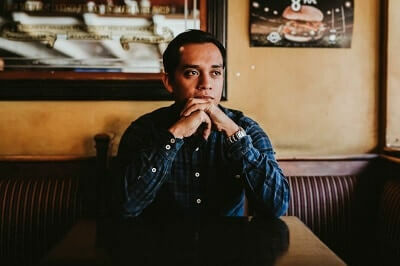 Also, I know this is not the best time to give you a sales pitch – but the blog here has a premium (paid) membership where you can connect with others, may be worth looking at it. So happy this article (and my sweaty days collecting this data going door to door) has helped. Yes, I am a equity partner in a CPA firm and we have various offshore bank solutions – would you consider supporting this blog and others with our services? well you are in a decent position with non-US relations and a HKID permanent status! With those, you should be able to go to a lot of local HK banks and apply – BEA, OCBC, even DBS – if you’re living and working in HK it should be much better than those who are online only / virtual businesses and ecommerce companies. We spoke to Jane on the phone and she was very rude and arrogant exactly what you described! Just want to know what is the update with HSBC? Were you able to get a bank account with another bank? I am in the process and would like some advice. Glad you enjoyed the blog – and sorry to hear about the HSBC problem. I can definitely help you and have a private member’s area where we can work together if that is OK for you – check out the membership program at http://www.globalfromasia.com/vip/ and I hope to work alongside you on it ! Just wondering when you have applied to multiple banks in HK, and out of sheer luck you get approved with more than one bank will they automatically open it or will they contact you first and say it has been approved do you want to continue? Help you can help me! This is Tony here from Guangzhou. Have your contact on wechat too. I am trying to get a hong kong company registered along with a hkg bank account. Will be working out from Gz as the rep office. But have been told by various ppl and agents in china that its really a lengthy and complicated procedure these days(upto 6 months). They are suggesting me to register a Trading Company in Mainland China. As per them this will greatly increase my chances to register a hkg company with a bank account in a much shorter time period. Would appreciate any comments or tips. Is it doable to open business bank account in HK with Israeli passport. Do they treat Israeli passport the same as EU passport or worse? How much time may it take to open the account? HI Guys, still trouble open Company Account in HK…the nightmare is over! neat.hk business account..within 2 days my application was approved, no initial payment, just send the BR and passport, address etc…i hope this will change the thinking of all traditional Banks in HK….personal account in 10 minutes! Hey Michael, which bank? We have a business account with OCBC but would like to know other banks as well.. I have a question hopefully you can advise.I have a Business account in HSBC and a Rep office in China. what can i write to satisfy them? Just tell them you moving to continue to do business in Hong Kong but no need to have physical employees and to save on cost etc. becoming more virtual. I just arrived in HK and its my first time here. I went to cities bank near Jordan and was served immediately 30min later walked out with an account. I’m from Europe and told them I have significant funds so immediately they wanted to help me. I got a citi gold account will take couple more weeks before fully activated and approved but they said not to worry as I have all the documents and they checked it was OK. But I also visited some HSBC branches and some are tougher than others.